This is the pre-trip newsletter for men and women of all ages and abilities joining our 2019 expeditions and walks. How has 2019 been for you so far? I hope you have been preparing for the mountains, staying fit, walking and climbing in your local hills, not working too hard and relaxing with family, friends and colleagues. NOW IS THE TIME TO JOIN OUR 2019 TRIPS if you have not already. Achieving our goals, reaching the summit, your chosen elevation or camp, basecamp, or your service project and returning safely. Please read down to learn more about all of our 2019 climbs, walks, and trekking peaks. Spaces are still available, so we hope you'll join us during this peaceful and sunny time to visit the Himalaya. We encourage you to take advantage and book one of the presently inexpensive flights which are still being offered. Please let us know if you need any help finding flights. EVEREST NEPAL SUMMIT CLIMB. Easier, warmer and less windy than the Tibet side of Everest. 60 days 7th April - 5th June 2019. www.EverestNepalExpedition.com . EVEREST TRAINING CLIMB CAMP 3 NEPAL.Test yourself at altitude with patient instruction with our skillfull leader and Sherpas. April or May. EVEREST TIBET TRAINING CLIMB NORTH-COL: World's easiest 7000 metre/ 23,000 foot high peak located on the shoulder of Everest. April or May. Learn everything you need to know to climb Everest in 25 days. MOUNT LHOTSE EXPEDITION: High Nepal summit for low cost, same route as Everest. www.LhotseExpedition.com . April-May, 60 days. World's 4th highest peak. Climb Everest route; branch off before high camp; ascend Lhotse Couloir. ISLAND TREKKING PEAK EXPEDITION: Nepal's most famous easy trekking peak. Climb to 6,000 metres / 19,500 feet in just 1 day. www.IslandPeakClimb.com . 22 days or 5 days (climb only) in April, May, October, November or December. EVEREST BASECAMP WALK NEPAL: Walk in the footsteps of Sir Edmund Hillary and Sherpa Tenzing, to the world's most famous basecamp. www.EverestBasecampWalk.com . 17 days in April, May, October or November. MOUNT ELBRUS is the highest and easiest snow peak in Europe (5642 metres, 18,600 feet) and one of the "7-Summits". See how you feel at high altitude in a short time at an affordable price. MOUNT MUSTAGATA EXPEDITION. 13 June – 4 July 2019, July – 26 July 2019 or 25 July – 15 August 2019. World’s highest mountain which can be skiied, boarded, or snowshoed. 24,000 feet / 7500 meters. BROAD PEAK: World's 12th highest mountain and one of the 'easiest' 8000 metre peaks! 16 June to 6 August, 2019. 52 days in Pakistan, includes extensive snow and ice training. Leader Dan Mazur: his 2nd Broad Peak Expedition. PASTORE PEAK - located near K2 and Broad Peak base camp and a perfect introduction to test yourself at high altitude. 16 June to 15 July 2019 (29 days). www.PastorePeak.com . Climb to 7,000 metres / 23,000 feet and learn the skills necessary to reach the summit of Everest, K2 or one of the 14 highest peaks. Do well and transfer to the summit at no extra cost. K2 TREK. The second highest mountain in the world, thought by many to be the ultimate trek. www.K2Trekking.com . 16 June to 10 July 2019, or 5 August to 29 August2019 (25 days). YOUR NEPAL VISA IS BEST PURCHASED WHEN YOU ARRIVE AT THE KATHMANDU AIRPORT: When you arrive in Kathmandu airport, you will fill out the arrival and visa forms available on the tables, and then the immigration officials will stamp your Nepal visa into your passport at the immigration counter. You will provide your passport sized photo and pay cash (dollars, pounds, or euros) for the visa at that time. The cost of the 90 day visa is approximately $100 USD, a 30 day visa around $60. If you forgot your photo, you have one taken there, for 300 rupees (but you will have to stand in another queue and change your money into rupees first. If you are staying in Nepal, get a single entry visa for the total number of days you will be in Nepal. If you are going to Tibet, please obtain a double entry Nepal visa for the total of number of days of your trip, including the time you will be gone in Tibet also (ie: if you will be in Tibet for 30 days, and in Nepal for 3 days at the beginning and 3 days at the end, you would obtain a 90 day double entry Nepal visa). Please Note: your Tibet visa will be obtained at the Chinese embassy in Kathmandu at a cost of $165 - $250, depending upon what country you are from. Your passport must be valid for at least 6 months from the END of the expedition and contain at least 2 blank pages. F: Preparation - what to remember. Please read the section below carefully. Thank you. 1) Purchase your flight ticket now. Flights are still available. Please let us know if you need assistance in booking your ticket. We are here to help. Delay in receipt of the following items listed below may result in an inability to get you onto the permit and perhaps even a delay of your departure from Kathmandu. [ ] Make your Oxygen order (if any) crystal clear at this time, number of bottles, masks, payment, etc. WE SUGGEST ALL EVEREST SUMMIT MEMBERS SHOULD NOW CONSIDER ORDERING 2 EXTRA BOTTLES OF OXYGEN. THESE 2 EXTRA BOTTLES WILL ALLOW YOU TO REST IN HIGH CAMP IF NECESSARY DUE TO WEATHER AND OTHER FACTORS. [ ] Make your Sherpa order (if any) crystal clear at this time, personal sherpa, quarter sherpa (equipment carriage service), payment, etc. FOR EVEREST ITS NOT TOO LATE TO REQUEST A PERSONAL SHERPA OR A 1/4 SHERPA (EQUIPMENT CARRIAGE SERVICE). PLEASE LET US KNOW. 3) Please bring all of your personal paperwork, including your original proof of insurance, carry at least two extra paper photos of your face in your pocket, etcetera. Shopping and drinks (coke, beer, etcetera) during trek and in Tibet. Phone calls and internet charges. Everest Tibet members: please bring at least $2250 cash with you for the expedition. 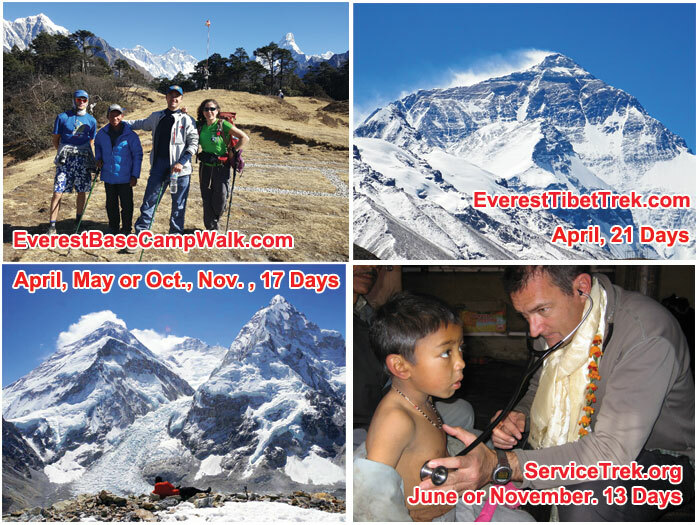 Everest Tibet Training Climb members: please bring at least $1550 cash with you for the trip. Everest Basecamp Tibet walkers: please bring at least $1450 cash with you for the trip. Tibet members: Please note that your amount of cash you need to bring is about $1250 more than our Nepal trips because it costs that much to hire a jeep to take you from Tibet back to Kathmandu early if you wish to leave before the scheduled end date of the itinerary. NEPAL BANK ATM MACHINES: There are good bank, cash, atm machines, especially in KTM. However, these cash machines will only distribute Nepali rupees, so you must bring foreign currencies, $, £, €, from home. Be sure to bring extra cash to Tibet and Nepal basecamps for tipping the sherpas and staff as many of them will not be returning to KTM. $, £, €, work well in Kathmandu. For Nepal walks and climbs, you will change money into rupees after arriving in Kathmandu. For Tibet walks and climbs, you will change money into Chinese Yuan at the border. 5) Helicopter rescue, repatriation and travel insurance are required and cancellation insurance is recommended. Do you have your proof of travel and mountain rescue insurances? Remember, you need to be covered for all mishaps, including both in town, en-route, and during climbing and/or walking. We are glad to advise you about different types of insurance and where to find them. Nowadays mountain rescue insurance is available for any person from every country in the world, provided by such companies as Global Rescue. If you have already sent the above, thank you very much. Note: Our staff will meet you at the airport holding a "SummitClimb" sign or the sign might bear your name. Our staff try to personally meet your flight at the Kathmandu airport and bring you to the hotel. We were able to meet all of our team members last season. Do we have your exact arrival (and departure) information, including: airline, flight number, arrival date, arrival time, coming from where? If you have sent the above, thank you very much. Before leaving the airport please change a little money ($20, 10 pounds, or 10 euros) into rupees at the exchange counter. You will get a better rate once you are inside Kathmandu, so please don’t change too much. When you walk out of the airport terminal, please walk slowly and carefully and look for the sign bearing your name (usually your last, or surname, but occasionally your first, or given name). The sign may also simply say "Summit Climb". In case we miss you, please take a 500 rupee taxi to the hotel. We did not miss anyone last year, but some members did not read the signs. If you are arriving early, please make sure you contact our office, so our staff can begin working on the permit, check your equipment, help with purchasing any missing bits, etcetera. PLEASE PRINT OUT ITEMS 8 AND 9 AND CARRY THEM WITH YOU AT ALL TIMES (ESPECIALLY ON ARRIVAL) IN CASE YOU BECOME LOST. 9) KTM HOTEL. Your trip includes 2 free Kathmandu hotel nights at the beginning and two free Kathmandu hotel nights at the end of the trip. You will be sharing. If you want your own single room, the cost is an additional $20 per night (during the included four free hotel nights) and for extra nights $30 per person for single occupancy. Please bring extra cash to pay for your extra nights and / or your single supplement. We often stay at the comfortable two star Hotel Shakti. It’s an excellent and classic hotel surrounded by green gardens and located in the heart of the city action near many delicious restaurants, the city's best mountain equipment shopping, and abundant nightlife all within a few minutes walk. The Shakti also offers lots of entertaining day trip (and night outing) options such as city tours, scenic flights around Mount Everest and much much more. Meals in Kathmandu are at your expense. 10) Arrive in KTM on the first day of our itinerary for the team orientation. All members must be present on the first day of our scheduled itinerary in Kathmandu unless you have made special arrangements. We need your passports on that day so that we can obtain the permit for you to go to the mountains, and do quite a bit of intensive orientation, training, and shopping before setting off for the mountains on the following day. It’s fine if you want to arrive earlier, and definitely a good idea if you have lots of shopping to do. Below are the dates we require you to arrive in Kathmandu (of course its no problem to arrive earlier). Everest Glacier School: 7 April or 21 April. Island Peak: 7 April or 21 April. Everest Base Camp Trek Nepal (and optional Island Peak): 7 April or 21April. Everest Tibet Training Climbs: 7 April. ABC Everest Tibet Treks: 7 April. 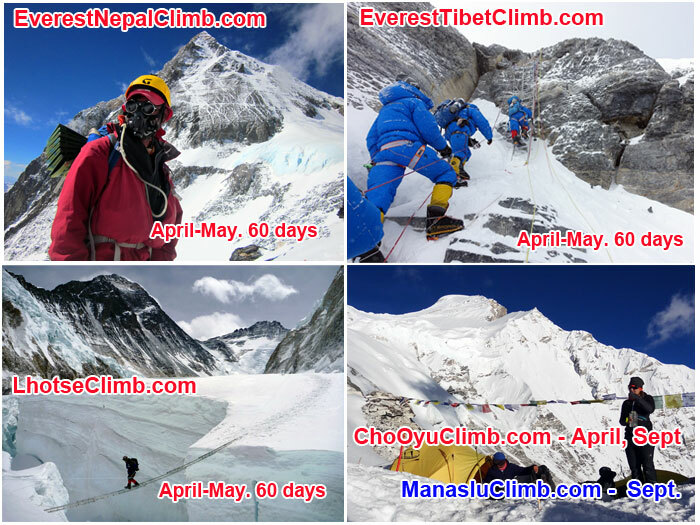 Everest Tibet Training Climbs: 1 May or 15 May. ABC Everest Tibet Trek: 27 April or 12 May. Everest Glacier School: 24 April or 8 May. 16) Buy your foam mattress in Nepal. Regarding mattresses, above basecamp, you may wish to have an inflatable mattress with a foam mattress underneath. Or several traditional closed cell foam non-inflatable karimat mattresses may be used. It is good to have 3 or 4 foam mattresses as they are inexpensive and you want to sleep warmly and comfortably at night. These foam mattresses are available very inexpensively in Kathmandu (and Lukla), so there is no need to bring any from home. Why fly around the world with a kit/duffel bag/hold-all filled with foam? Our planned schedule allows plenty of time for equipment shopping in Kathmandu. Snack Food: Bring your own snack food. All basecamp and walk meals and high meals (3 per day) are included in our full-service expeditions. We provide more than enough food and cooking fuel for three meals per day on the high mountain. However, we ask each climbing member to provide their own daily-snacks and freeze dried meals at high altitude while climbing above basecamp. We do not provide any daily snack energy food, you need to provide your own. Please remember to bring your daily snack-energy mountain food for each day we are climbing above basecamp on the mountain. This food would consist of chocolate bars, power bars, energy gel, rehydration drinking powder, sweets, nuts, sausage, cheese, etc.. More and more items are available in Kathmandu. A wide variety of imported sweeets, snacks, and chocolates are available, with quality brands such as Cadbury, Snickers, Lindt and Cafe d'Or in abundance. The prices are not bad. There are many kinds of local snacks and powerbars available, but they still do not import foreign power bars, energy gel, etcetera. Everest: "One-Sport Everest Millet" or "La Sportiva Olympus Mons" boots high on the mountain and sturdy-lightweight leather boots for walking to camp ABC. Lhotse and Cho Oyu: "One-Sport Everest Millet" or "La Sportiva Olympus Mons" boots high on the mountain and sturdy- lightweight leather boots for walking to camp 1. Please note: Members who have tried to wear too-thin leather single boots to the summit of our 7000 metre / 23,000 foot plus climbing peaks have suffered frostbite. Not recommended, and, in fact, for 7000 metre / 23,000 foot plus climbing peaks we may disqualify you from the trip if you are planning to climb in only leather single boots. Frostbite is not an option on our expeditions. Everest Summit Attempt Bonus: $600, Summit Success: $1000. Lhotse Summit Attempt Bonus: $500, Summit Success: $800. 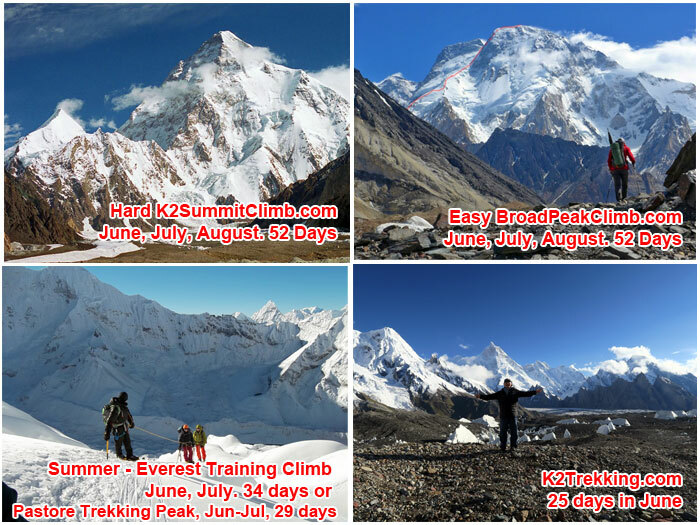 North Col & Everest Training Climb Summit Attempt Bonus: $150, Summit Success: $250. The above amount of money may be split between climbers who were in the summit party. If you have a personal Sherpa, your tip will be at least 30% more. We request you to bring this money with you to basecamp in cash, and be ready to pay it there, as many of our staff are local and will not be returning to Kathmandu with us. Traveller’s cheques and credit cards may be of use in Kathmandu, but they will not work in basecamp. 22) Telephone. We have a mobile phone in basecamp. The cost is around $1 - $2 per minute, depending on which country you are ringing and it’s free of cost to receive incoming calls and texts on the mobile phone.We plan to have access to mobile and satellite telephone during the walk too. Those wishing to use our sets are required to post a $100 deposit, prior to departure from Kathmandu. The cost for satellite phones is $4 per minute. Incoming calls are not possible. If your usage exceeds the deposit amount, you will be required to pay more cash in basecamp, or stop using the phone. Be sure to bring enough $, £, or €. While unable to receive satellite telephone calls, at times members can receive short satellite text/SMS for $4 a message from their friends and family. 23) Website where your friends, family, and colleagues, can read about your expedition. There may be a website where your family, friends, colleagues, and sponsors can watch the progress of our climbs and walks. This website is a public service from www.SummitClimbNews.com and www.SummitTrekNews.com . Once reaching the site please go to “recent news” and you will see the dispatches from your expedition. We have traditionally asked all members to become involved and to write or phone blogs - "dispatches" or reports about the progress of our expedition and also to post photos for the folks at home to see, during the expedition. However, these dispatches are only to be about your impressions of our climb and are strictly for public viewing. Please don’t confuse them with personal phone calls to family, loved ones, friends and colleagues at home. 24) Battery charging: laptop, ipod, mp3 player, and/or digital camera. On our climbs, we often bring a solar charging system on the expedition that members have access to. As long as there is sun, we are able to charge batteries easily on the mountain. If your device has a 12 volt "automotive cigarette charger" please bring it (order one on the internet before you go) as that will be the best thing for basecamp. In Kathmandu, be sure to bring your wall charger compatible to Kathmandu's 220 volt current. Also, we encourage you to bring your own smaller solar panel, as these seem to work very well. Computer, ipod, mp3, camera note: Laptops work well up to about 4000 metres/13,000 feet. Altitude can destroy or wipe hard drives bigger than 7 - 10 GB above this altitude, or hard drives that have a moving disk. There are several options out on the market for laptops with non moving hard drives that work well at altitude. Internet is available in basecamp and wifi or 3g is also generally available in basecamp. Last year it often worked well, although sometimes the internet was down for periods of time. Sometimes we have to walk for 15-20 minutes or so to reach the high point where the free internet works. 25) Bring or buy warm mittens. Special warm high-altitude mittens are necessary for all of our climbs, for example: Outdoor Research Alti-Mitts. Nowadays, we can find many warm mitten choices in Kathmandu. You won't need to wear any liner gloves inside these mitts (they already have their own integral liner) so fit is very important. 26) Bring or buy a figure 8. Climbers, please be sure to bring a "figure 8" for rappelling/abseiling. Many modern rock climbing descenders ie: "atc’s" do not work on icy ropes and knotted fixed line, and are a liability because they slow you and the team down considerably. It is hard for some people to believe until they witness this personally, but we are asking you to believe it now. Please go out and purchase a figure 8. You may also purchase a figure 8 in Kathmandu. 29) Everest and Lhotse oxygen: For full service Everest & Lhotse climbers, we are now giving FREE OXYGEN, no charge for a five-bottle set. Our Sherpas will try to help you carry the oxygen, and 5 four-litre bottles of oxygen are recommended for Everest and Lhotse - NOW INCLUDED FOR FREE FOR FULL SERVICE MEMBERS! We encourage members on Everest and Lhotse to purchase a few extra bottles for insurance in case of a longer stay at high camp or a second summit attempt due to bad weather. Web: www.SummitClimb.com and www.SummitTrek.com . Contact Us at: info@SummitClimb.com & info@SummitTrek.com .